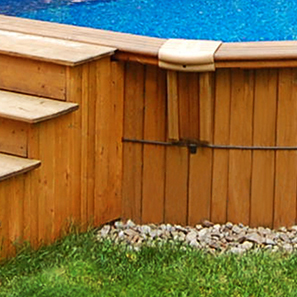 Made wholly of treated pine, our pools are particularly winter and harsh weather resistant. Our experience has shown that our pools are particularly winter and harsh weather resistant. This is not surprising, since treated pine is a wood species that is sturdier than cedar. A UNIQUE TREATED WOOD PRODUCT THAT FEATURES NUMEROUS ADVANTAGES. DON’T SETTLE FOR CEDAR. THERE IS A MUCH BETTER CHOICE. 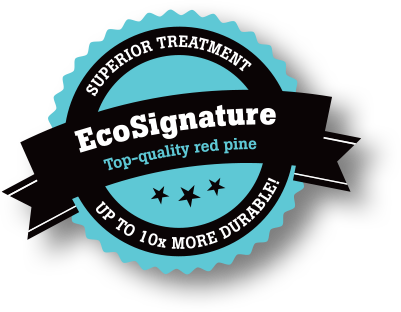 EcoSignature impregnated pine from Aqua-Wood is significantly better than cedar. When you choose an Aqua-Wood pool, you are choosing a green and non-toxic product that is designed in Québec to resist our harsh winters. The wood we use is pressure treated using a new ACQ (Alkaline Copper Quaternary) green process that poses no danger to human health or to the environment and does not contaminated water. This new process is also called “alkaline copper preservative composite”. The non-toxic and green ACQ process should not be confused with the toxic CCA process. Consult our FAQ in order to make an informed choice before you purchase your pool.